A few months ago, the latest book written by one of my absolute favorite chefs – Yotam Ottolenghi, was published. 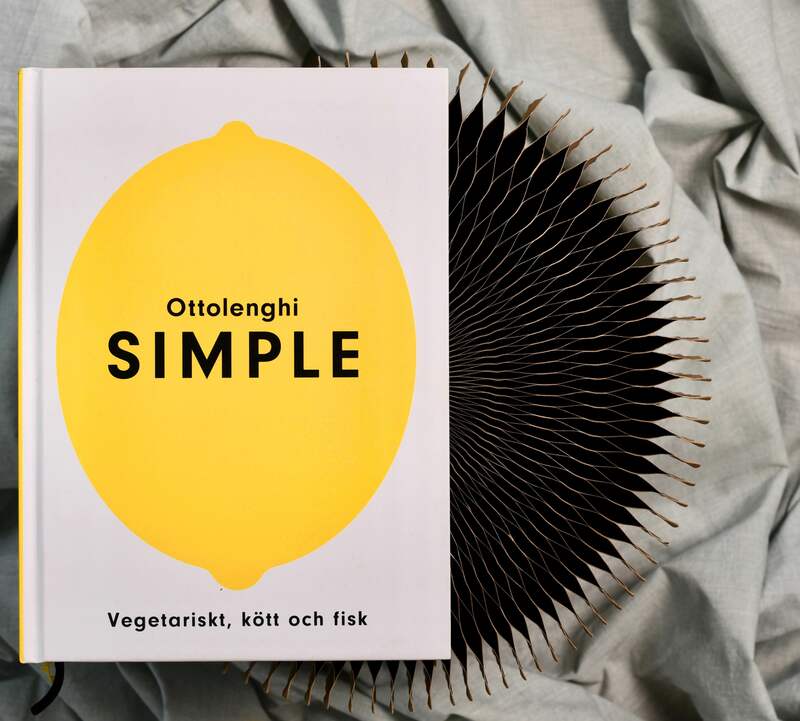 Today it’s time for me to review the book Simple and of course make something really tasty (and simple) from the book! Ottolenghi quickly became a kind of icon for vegetarian food from the Middle East. 7 cookbooks further and at least half of the world now keeps rose water, pomegranate and the typical spice mix Zaataar in the cabins. Or should I say, at least Holland and the rest of Europe. In Sweden, I feel a rather new interest for food with Moroccan, Israelian and Turkish origin. I’m still surprised how much this kind of food seems to be up here in the Nordic countries. But maybe I’m wrong, hope so. And if not, I have NOW the chance to help them on the way! The book Simple is really simple. Simple in it’s layout, recipe selection and ingredients (if you disregard some of the wonderful specialties😉 typical for the region ). This must be a book that suits everyone! Funny everyday food that dosen’t take very long to make or requires a lot of work. But oh, the sweet taste. Like a taste bomb in every bite! But how do you exactly define simple food? When thinking about it, it turns out to be very individual. Everything depends on prior knowledge, nerves, imagination and of course the time you have to spend on your food. To cover al theses differences, the book has been given made a color system very much reminding about cookbooks from the 70s. Handy? Absolutely. Beautiful? Less sure about the one. The previous books radiate more “chick” with choice of paper and design. Oh well. The recipes are of a mix of vegetarian, meat and fis I fish. I find it rather easy to find good taste combinations for making green recipes from the book. Meat and fish can easily be removed and replaced with something else. And you are left with al great taste! From the book I choose to make something very simple: mashed potatoes with a herb oil. It may sound almost too easy but don’t be fooled. A mashed potato that is both creamy and airy without either butter or milk can be a difficult one. To make it taste delicious and also different than the usual mash flavored with white pepper and nutmeg is a true art! The secret is called olive oil and lovely herbs. A mashed potato with mint, lemon, garlic and thyme tastes wonderful as it is but can also be very well combined with crisp tofu or maybe some vegetable patties? Don’t forget to top the mash with the delicious herb oil when serving, mjam! 1. Put the potatoes, thyme, mint, garlic, lemon zest and 2 teaspoons of salt in a large pan. Add boiling water on top, the water should be 2 cm above the potatoes. Gently boil the potato for about 25 minutes or until they are soft enough to mash. 2. Prepare the topping while the potatoes are boiling. Add oil, garlic, thyme, mint leafs, lemon zest and lemon juice to a small bowl with a pinch of salt and plenty of black pepper. Set aside. Remove the thyme and mint sprigs and pour the potatoes back into the pan (together with the left garlic and lemon zest). Mash the potatoes. Add approximately 90 grams of olive oil and about 150 gram of the remaining potato water slowly to get a smooth mash. 4. Place the mash in a bowl and make pits in the surface with the back of a spoon. Add the herb and garlic oil evenly over the mash and finish it off with some black pepper.